A 180m-long cave, with stalactites up to 2m long, has been discovered in the west coast of the Highlands. The underground chamber in Applecross was found by members of the caving club, Grampian Speleological Group. The cavers enlarged a small man-sized entrance they had found, to explore a water-filled passage that led to a series of underground chambers. David Morrison said it was "possibly the most beautifully decorated passage anywhere in Scotland". He added: "This is a significant discovery in the context of Scottish caves and I believe we have probably found the 'master-cave' of the area." 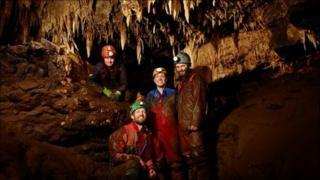 Mr Morrison found the cave along with fellow cavers Ritchie Simpson, Toby Speight and Jane Stewart-Boland. The Grampian Speleological Group, which has more than 150 members, was founded in 1961 by Alan Jeffreys. Mr Jeffreys, a leading member of the club and the Scottish Cave Rescue Organisation, said the discovery was particularly fitting as it coincided with the club's 50th anniversary. He said: "Over the past 50 years the GSG has played an active role in the exploration and scientific study of Scotland's natural and manmade underground heritage. "From the discovery of remains of three bear skeletons at Rana Hole in Sutherland and the remains of bronze and iron age artefacts at High Pasture Cave in Skye, through to the exploration of more recent mines throughout Scotland, the club has played a valuable role in our understanding of what lies beneath our feet." Club members are continuing exploration work in the Applecross cave and hope that the sound of running water, which can be heard at the end of the cave, promises further discoveries.